We’ve been just itching to share this darling pink pomegranate bridal inspiration from Anastasia Strate Photography, featured on page 121 of the Spring/Summer issue of Brides of Austin! Taking hues from a paradise-inspired palette, these portraits were taken against the beautiful backdrop of Horseshoe Bay Resort, a lakeside oasis in the Texas Hill Country. 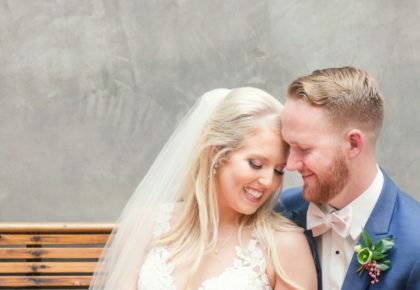 The bride wore a stunning gown and accessories from Julian Gold, with a chic and classy updo by Silique Salon fit for a princess and bright, tropical-inspired makeup from Cren de la Cren, Beauty by Katherine Crenshaw. The tablescape certainly couldn’t be overlooked and was gorgeously completed by an overflowing freeform bouquet of peonies, roses, berries and ferns galore, courtesy of The Flower Girl, and a matching gold and fuchsia place setting from Premiere Events. Carrying on the pink pomegranate theme was a stunning cake by Simon Lee Bakery, adorned with fruit and seeds and a cascade of cheerful yellow down the tiers, and the stunning pink pomegranate invitation suite from Fine Day Press with watercolor details adding brushed pops of vivid color to an elegant yet fun palette. 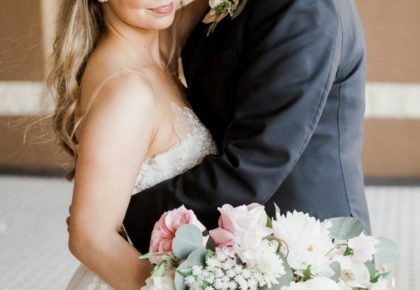 Every detail of this shoot has us swooning. Austin brides, if you’re looking to get married in paradise, you don’t have to go far – be sure to check out this amazing venue in your own backyard!